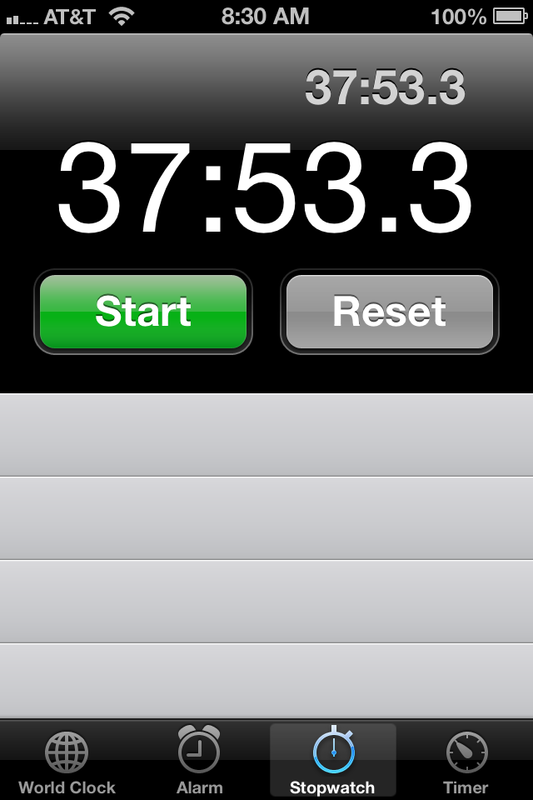 As the time shows on our most recent trip, I fell well short of finishing under my goal of 30 minutes. When you live in a small town, you often have to invent things to do. And when you’re easily entertained like we are, it isn’t hard to do. My son and I recently found such a way. And as most of life does in a small town, it revolves around Wal-Mart. My son hates going shopping. Of course, that’s not necessarily a bad thing. But, as you can imagine, circumstances are such that he often has to go with me. And now that’s where the fun comes in. I told S last week that I could make the trip in less than 30 minutes. HIs immediate reply? “No, you can’t,” he laughed. So the challenge was on! Our goal: to get in, buy our groceries, check out, and get back to the car. All in less than 30 minutes. I had a short list. Of course, I always start with a short list. It just somehow grows much larger as I walk through the store. If you don’t live in a small town, you probably don’t have the joy of knowing how important Wal-Mart is to your life. You buy your groceries there. You buy your cleaning supplies there. Soap, shampoo, and other, ahem, personal items. The thing is, though, almost everyone in town shops there, too. So it also becomes your social experience of the week – or several times a week if you’re like us. And it works out well for me because I’ll strike up a conversation with total strangers. Again, this isn’t a bad thing – unless you’re in a hurry. So there we are, me searching in vain for several items, dodging employees who are stocking the shelves, and visiting with about every other person. And telling a stranger that, Yes, buying Double Stuff Oreo’s was the right choice because they’re soooo much better than regular. I mean really, how can anyone buy the regular Oreo’s when the Double-Stuffs are right there?! And there’s my son is next to me, so excited about trying to beat our time that he’s literally jumping up and down next to the cart. I almost made it, too. But when I got ready to check out, I remembered I had forgotten paper towels – the one thing I had come in for. Doh! Once we were back up front, there was a wait. I could go through the self-check line. I refuse to do this for the simple reason that the last thing I want to do is work at Wal-Mart for free. We’re standing in line, when I hear, “You’ve only got a minute and 25 seconds left, Dad. You’re not going to make it.” S can’t help but laugh. I laugh, too. It is funny that I can’t buy 10 items on a list (that mushroomed to about 37 items) in less than 30 minutes. But hey, we live in a small town. What else is there to do? Thank you, Tish. I’m glad you’re enjoying it. My kids slow me down so bad at Walmart. If I go alone I can usually do it in about 30 minutes. When I take my kids it turns in to an almost 2 hour event. That’s funny. When my son was little, I dreaded going. It took forever!